In Dreams by Raymond Carver we have the theme of identity, connection, ignorance, awareness, paralysis, love and loss. Taken from his Call If You Need Me collection the story is narrated in the first person by an unnamed narrator and it may be significant that the narrator is unnamed as Carver may be playing on the idea of identity. It may also be important that Mary Rice does not learn the narrator’s name till the final paragraph of the story (the reader never does), even though she has been his neighbour for three years. The fact that the reader is aware of the name of every other major character in the story and even some of the minor characters names too may also suggest the idea of or importance of identity. It is also interesting that Mary Rice’s husband, who is also unnamed, appears to mirror the narrator. Not only is he nameless but he has also left Mary, which would suggest he didn’t love her. Though the narrator never leaves Dotty, there is no emotional connection between them, no expressions of love. It is also interesting that the narrator suggests that when he moved the mattress to the basement, ‘it was like starting over.’ This may be symbolic as it could suggest the necessity of change in the narrator’s relationship with Dotty, though he appears to be unaware of this necessity. The sense of paralysis within the story is very noticeable with regards to Dotty’s character. For a lot of the story she remains in bed, which may suggest a paralysis or going nowhere. Also she may be stuck in a childless and loveless marriage, a marriage that the narrator doesn’t appear to be aware is in trouble. It can be difficult to analysis dreams but with regard to some of the dreams that Dotty has it is interesting that in one she dreams she is a boy and in another she dreams she is a dog barking. These dreamt transformations may suggest the need for or the desire by Dotty to change her life. It may also be significant that in another dream Dotty looks for the narrator’s assistance but is met with silence. This may suggest that Dotty is aware that there needs to be a change in her life or in her relationship with the narrator but his silence in the dream suggests a continued paralysis for not only Dotty but for the narrator too. It is also worth noting that in Dotty’s first dream she is unable to start the engine of the car or boat. Again this would suggest a paralysis or an inability to move. There is no doubting the sense of loss for Mary Rice when Michael and Susan die in the fire. Despite this, several months later the reader becomes aware that Mary is planting some of the seeds she found in her children’s bedroom. This regeneration or start of life may be significant as it suggests Mary’s ability, though it is difficult, to move forward. Unlike Dotty, Mary Rice does not appear to be paralysed despite her horrific loss. Mary’s name may also be important as she shares her name with the mother of Jesus, who many would believe died to give others life. Also Mary’s surname appears to be significant. Rice would be a daily staple for a large proportion of the world’s population, it gives or allows for the continuation of life. Carver also appears to be making references to the Holy Trinity and the three day period before Jesus was resurrected (again the idea of life). Dotty tells the narrator that she hasn’t seen Mary’s husband in three days. The reader is also aware through the narrator that Mary moved into the neighbourhood three years ago. 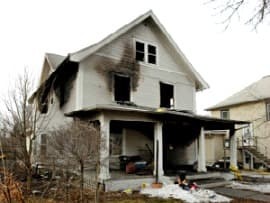 At the time of the fire, there are three people, Michael, Susan and Rosemary caught in the house. It is also interesting that Mary is invited to dinner in March, three months after the children have died. The suggestion of religion or at least divine intervention is also noticeable in the story when Dotty is talking to the narrator, the day after the fire. ‘God, that poor, unfortunate woman. God help her. And us too.’ This sentence is important as not only is Dotty empathizing with Mary but she also appears to be seeking God’s help in her own relationship with the narrator. It is also interesting that the narrator doesn’t respond to Dotty, rather the reader learns about the people driving by the house to view the damage caused by the fire. There is a sense of irony with this, the people driving by to view the damage by the fire, as there also seems to be irreversible damage in Dotty and the narrator’s marriage too. Despite the narrator considering himself to be a rich man (spiritually) there is every possibility that he may be living his life in ignorance. Near the end of the story, despite Dotty having had another dream, the narrator doesn’t ask Dotty about her dream. This is the first occasion that this happens in the story, the narrator not asking Dotty what she has dreamt. Also Dotty doesn’t relay anything to the narrator about her dream, this is also the first time that this happens in the story. This may be significant as symbolically it can suggest that the narrator no longer knows what Dotty is thinking, which may suggest not only a lack of awareness but an ignorance too. It is also possible, the fact that Dotty does not relay the information on her dream to the narrator, that he no longer knows her which would play on the theme of identity. Whether Dotty remains in her marriage to the narrator is never known nor is the reader made aware of any changes that may occur for the narrator. Does he begin to understand that he is not as rich as he may suspect? The reader never learns, just like they don’t learn his name. There may be a continued paralysis for both Dotty and the narrator or there may not. Dotty may decide that she is the only impetus that is needed to change her life. However one thing that seems certain in the story is that Mary appears to be moving forward, despite what has happened to her. McManus, Dermot. "Dreams by Raymond Carver." The Sitting Bee. The Sitting Bee, 8 May. 2016. Web. Thanks G. I’m glad you found the post helpful.